So it’s 2016, and Capcom wants to make an eSport. Specifically, Capcom Osaka! We really need to talk about this! If you want a quick and easy dissertation about whether this game is good or not, and whether you should buy it, then I’m going to give you a quick “no” and guide you to a different games site because that’s not how we do things at DigitallyDownloaded. 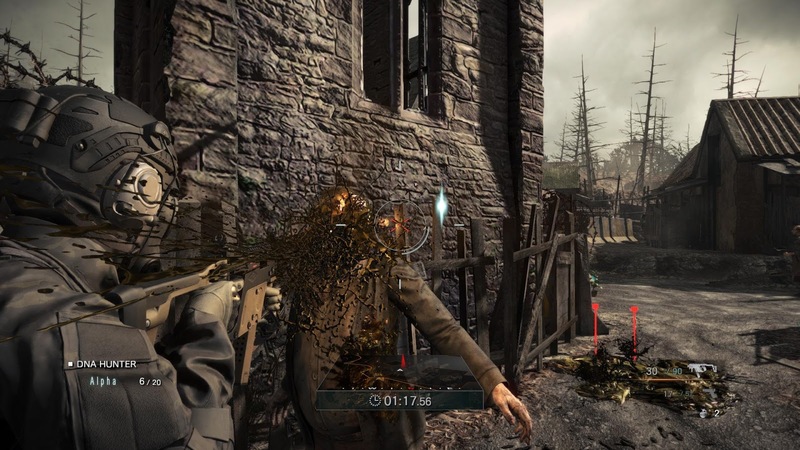 Bottom line is, Umbrella Corps is an arena multiplayer shooter much like Counter-Strike, set in the Resident Evil universe with fast combat and some zombies mixed into the mechanics but the absolute most important thing to note is that this is a Japanese developed multiplayer (almost) first-person shooter, and arguably the first of its kind. Here is a game which is simultaneously visionary in its domestic market and derivative as all out in the international scene. 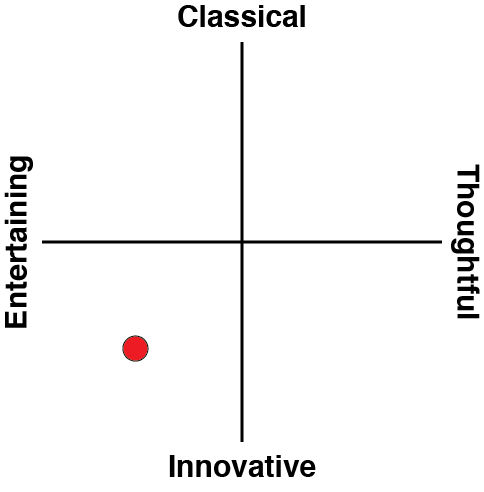 Famitsu, in its review of this game, gave it a 36/40, while most press in the West are more mixed in their response. 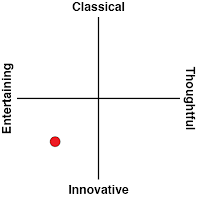 Interesting, right? Related reading: For another recent Resident Evil release, check out the remaster of Resident Evil 0. Brad's full review. Umbrella Corps comes at a discounted price right off the bat, and offers two multiplayer modes and a single player mode. In multiplayer you can choose either Objective, which rotates between a variety of game types such as Capture Points or Bounty Hunting, and One Life Mode which pits your team against the other in a straight up deathmatch. Multiplayer matches can be played in casual, ranked or custom modes, with a strong focus on solo-ranked matchmaking. There is a weapon unlock system based on your performance in ranked matchmaking, but this system is well designed to increase the complexity of the game without necessarily giving more powerful weapons to higher ranked players. Furthermore, Umbrella Corps offers a single-player mission mode called The Experiment. Unfortunately absent is a bot-match mode, although a co-operative survival mode is set to be patched in at a later date. The multiplayer mode is where you’re going to spend the majority of your time, and it’s an exhilarating experience while it lasts. Matches are always three-on-three, set in very small maps latticed with passageways, crawlspaces and platforms. Movement is lightning fast and you have the option to crouch or go prone with barely a penalty to your speed. There is also a cover system in place, but it’s a bit unwieldy and I often found running at enemies to be more effective and fun. Players are offered a primary weapon which is for the most part either an assault rifle or a submachine gun, a pistol or shotgun for a sidearm and some grenades. Gunplay is solid, with each weapon feeling both powerful and exactly what you would come to expect having played any other military shooter. Players also get an axe-like melee weapon called the Brainer which I have a bit of a love-hate relationship with. Upon whipping it out you’ll notice the range is massive, comparable to the max damage radius of a combat shotgun in other shooters. One hit is an instant kill and your character will run even faster with the Brainer as their active weapon – it takes some quick reflexes to shoot and kill an enemy before they run up and swing at you. This results in many online matches devolving into frantic melee-fights without an appropriate counter strategy. Whether Capcom will patch this is up in the air, but at the moment multiplayer does have the potential to be very broken. An interesting addition to multiplayer matches however is the presence of zombies in all the maps. Unlike regular Resident Evil fare, these zombies are passive and casually shamble around the map ignoring your character. That’s because each player is equipped with a “Zombie Jammer” backpack which effectively renders you invisible to the undead. The jammer is targetable by gunfire however, which means the horde of zombies immediately turn on you if you’re unlucky enough to get your jammer disabled. This opens up a range of strategies which otherwise wouldn’t be present in multiplayer arena shooters, but at the same time isn’t such a big gameplay element that the metagame revolves around it. 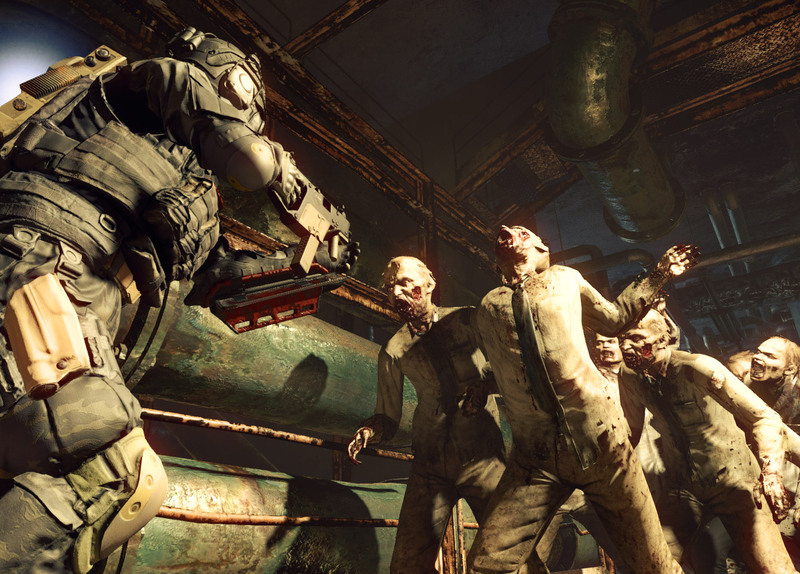 It’s good that the Zombie Jammer mixes things up a bit because in every other regard Umbrella Corps plays much like a lesser iteration of any blockbuster pew pew shooter. This is a game which delves so deep into its Western shooter reverence that there’s no room for ideas from Resident Evil. At times, it feels like a licensed game with Chris Redfield and Hunk skins on some characters. The continuity fanservice mostly manifests in the map design, which uses locations and zombies from far and wide in the long running Resident Evil series and even puts the appropriate zombies in the appropriate levels - a nice head nod to long term fans of the series. For newcomers though, this game does not do the franchise much justice. While being named Biohazard: Umbrella Corps to better associate with the brand in Japan, the Western release is merely titled “Umbrella Corps”. The third-person over-the-shoulder camera angle popularised by Resident Evil 5 and 6 is implemented almost identically here, but in a multiplayer arena shooter this creates more trouble than good. It means that the player’s field of vision is narrower and rotates slower than a first-person perspective, and 15 per cent of the left side of the screen is always covered up by the player character for no explicable reason. There is no attempt to create any sort of brooding tension, not even in the single player mode, and the design of the game seems to lean towards faster paced action than the slow, almost strategic atmosphere that the numbered Resident Evil titles go for (well, at least they did until the fifth game). I can imagine some die-hard Resident Evil fans denying the existence of this game purely for how distant it is from everything else related to the franchise. Others might be glad to play a tactical shooter with some RE skins. I’m really curious to see how Capcom will continue to handle the online aspect of Umbrella Corps. The matchmaking modes and lobbies are well crafted, and the server latency is good for a game which relies so much on multiplayer. The metagame is not ideal and I don’t think there’s truly enough depth for a competitive scene to form, but it does take skill to succeed in this game and there will be some talented players at the top of the ranking charts. The biggest problem though is that it neither feels like Resident Evil, nor does it offer a unique experience compared to similar titles. I do hope that Capcom learns from its experience with Umbrella Corps and doesn’t write off the concept of a Japanese eSport or shooter as a dead end, because there is definitely potential here underneath the shakiness of it being a first attempt. Now let’s focus a bit more on the single player mode, which honestly feels like a complete afterthought. In it, you play through a variety of missions set on the multiplayer maps where you need to kill a certain number of zombies. There are a few variations in later levels and it does get quite challenging, but it’s over quickly and the gameplay never feels unique. At the very least it’s something to do when there are no multiplayer matches to be found (an unfortunately common occurrence) but since you don’t earn any rewards from this mode to use in multiplayer, it’s nothing more than a small distraction. In terms of production values, Umbrella Corps is again all over the place. There is a frustrating mix of beautiful rendered stages which clash with awkwardly modelled zombies that show their textures up close. On PC, a lack of graphical customisation options limits the appeal as the game doesn’t seem to run efficiently. I experienced quite a bit of slowdown, especially in the more cinematic moments such as the Brainer kills. I do love the overall vision of the graphics and the design of stages which highlight the Resident Evil universe – the diversity of the levels effectively highlights how far the franchise has come. In every locale I see the vision of something great, which was most likely hindered by budgeting issues. Related reading: The Evil Within came to us from the original creator of Resident Evil, and is a worthy horror title in its own right. Our full review. 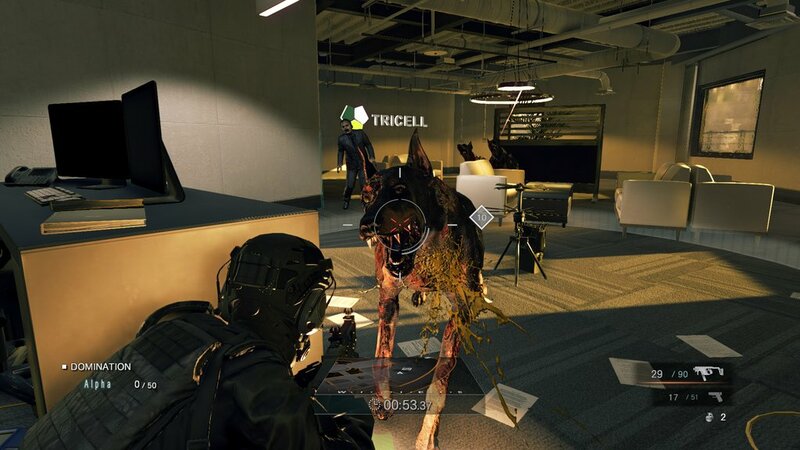 Umbrella Corps is an interesting aberration of a game, coming almost entirely out of left field from a studio not known for games of this genre and bearing equal parts ambition and clumsiness. 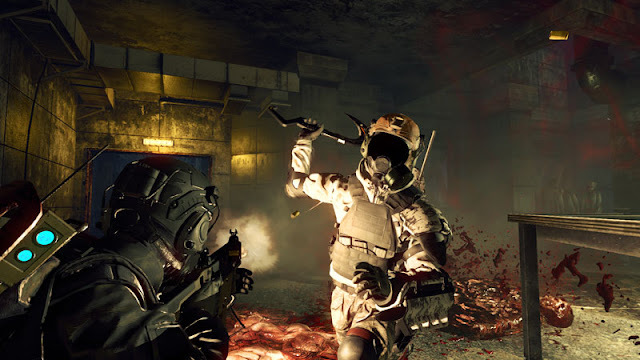 As a study in game design and franchising it is a fascinating title, and watching how Umbrella Corps grows as the developers add patches will reveal a lot of information regarding the Japanese gaming scene in comparison to the international market. That being said though, this is not a fantastic game by any account and while there’s a little fun to be had in a frantic online match, there are much better ways to get your competitive shooter fix.